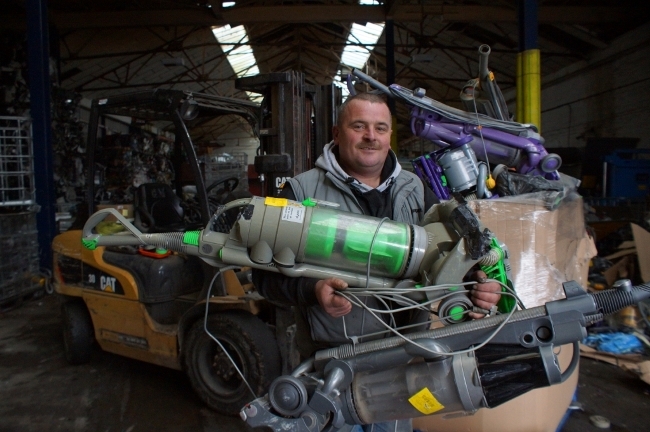 A North Yorkshire waste management business is cleaning up after being awarded a contract to recycle components from defunct vacuum cleaners. Each month Ripon Recycling, based on Pannal Business Park, takes delivery of thousands of Dyson machines, which are then stripped of parts that can be recycled. In addition, the business – which started less than a decade ago with just three members of staff and now employs a workforce of more than 30 – works with some of the biggest waste companies in the country. It also has contracts with North Yorkshire County Council, Leeds City Council, Yorwaste and WasteCare, where it reclaims circuit boards and components from redundant and outdate IT equipment. To compete for additional business, Ripon Recycling created a device that extracts mercury from LCD television screens. It is also expanding its waste card and paper collection services for local businesses in the Harrogate District. Ripon Recycling owner Steven Hullah said: “Over the last eight years we have developed a successful business that not only helps stop thousands of tonnes of waste going to landfill each year, but one that has given work to in excess of 30 people. “We live in a disposable society where it is cheaper to replace electrical items rather than repair them. “However, within these items there are elements that can be used again, and our expertise is in extracting them. “We won the Dyson contract thanks to our expertise with recycling component parts from plasma and LCD televisions.